Panel – Brian Norton, Belva Smith, and Wade Wingler – Q1- Unwanted phone calls Q2- Visual voicemail for Android Q3- HIPPA-compliant Text Messages Q4- Wireless Button for Triggering Amazon Echo Q5- App Showdown: Dragon vs. Windows Speech Recognition Q7- Wildcard question: Where do you put all the stuff you capture (docs, emails, notes, todo’s, etc. BRIAN NORTON: Hello and welcome to ATFAQ episode 88. My name is Brian Norton and I’m the host of the show. We are so glad that you’ve taken some time to be with us this week. We’ve got a great line up of AT questions for you, but before we jump into those, I want to take a moment to go around the room and introduce the folks who are on the panel today. Today we have Belva Smith, the division team lead on our clinical assistive technology team here at Easter Seals Crossroads. You want to say hey? BELVA SMITH: I want to say hey, and I feel a sense of freedom. BRIAN NORTON: Why? You are not in a corner anymore? BELVA SMITH: I’m not in the corner. WADE WINGLER: I’m stuck back in the corner. BRIAN NORTON: Belva gets stuck in the corner when she comes in here and record. We have a very small room and limited seating spaces. Very cool. You’re free today. BRIAN NORTON: Excellent. We also have Wade here. BRIAN NORTON: Wade is the Vice President here at Easter Seals Crossroads. We are glad that he’s taken time to be with us today. WADE WINGLER: Happy to be here. BELVA SMITH: That’s exactly what I was thinking. He’s on diaper duty. BRIAN NORTON: Just a week old, two weeks old? BELVA SMITH: She was just for last week. BRIAN NORTON: Not even a week. He has his hands full at home. WADE WINGLER: Probably at home listening to the show. Hi Josh. BRIAN NORTON: He really wants to be here. WADE WINGLER: Hi Penelope. Your daddy is famous. BRIAN NORTON: That’s right. Josh, who is usually here, is the manager of our clinical program. Again, he is on diaper duty. It’s just the three of us today, but we are going to do our best to tackle these questions. As we go through that, we just want to make sure that you know that you can provide us feedback and chime in on the question as well. We have a variety of ways for folks to kind of connect with us, to either ask questions or provide some feedback, for the answering some of the think we may have left out of our answers. You can do that through our listener line, 317-721-7124. You can send us an email at tech@EasterSealsCrossroads.org. Or send us a tweet with hashtag ATFAQ. You can send us your feedback or questions in those ways. Today we actually start off with a couple of feedbacks from a few individuals. We are going to dig into those first before we jump into the questions. BRIAN NORTON: The first one came through email, so I’m going to read it. It says, team ATFAQ, I had a couple of ideas for the musicians question. Last week we tackled a question about a musician who had low vision and was trying to read his sheet music. This is there feedback. I’m going to assume this person still has useful vision but is having issues with the placement of a traditional music stand. Otherwise braille music maybe where they need to focus on learning. Remembering back to my youth and playing the trombone, I had a marching band music stand would connected to the trombone where the mouthpiece is inserted. This would bring the music to within a foot of my face. However, traditional sheet music would not necessarily work here without some sort of rigid backing. Probably the sheet music would need to be reduced in size, although the closer proximity to the eyes may offset the smaller text size. Goes along with the high-tech approach, in combination with the marching band stand, it might be possible to utilize a device like the iPad mini where there is not much weight but a PDF file of a music sheet could be viewed in iBooks or a similar app. The iPad would also allow for inverted colors if the person’s vision loss will be offset by that feature. Using a finger to swipe to the next page may also be easier that a more traditional paper method. It would’ve been nice to have the 30 plus years ago. Keep up the good work and I look forward to the next podcast. Thank you. This is Mr. Souldan. Thank you for chiming in and giving us that feedback. I definitely agree. BRIAN NORTON: He could do the pages, just flip the pages with a pedal? BELVA SMITH: Yes. The one that’s very cool. I will say, Mr. Souldan also said #ATFAQ, hey Brian, I’m not a twitter user, but here you go, tweet tweet. BELVA SMITH: Oh my gosh. BRIAN NORTON: He gave me a shout out on Twitter. I’m always looking for those. Thank you guys very much. Great feedback. BELVA SMITH: Home delivery is what we were talking about. BRIAN NORTON: Exactly, home delivery where you can shop online and it gets delivered to your house. We are going to play this one. This came over the phone so we will play for folks. SPEAKER: Hi, this is Chris Green out in Utah. Long time, no speak to. I was listening to the frequently asked questions podcast early this morning and wanted to give you a little bit of feedback about my experience with the online shopping. I use the Click List app at my Smith’s store. Smith is the affiliate of Kroger here in Utah. I am more than delighted with this thing. It helps me so that I am able to do all of my shopping by myself, other than the pickup. I can choose what I want. I don’t have to have anybody describe anything to me. I can drill down to the app. It’ll give me nutrition information, complete descriptions of the food. They have coupons, digital coupons that are on there. I know Belva said she doesn’t use coupons, but my personal experience last Saturday, I picked up my things in order. On my $154 order, I use coupons to get a discount of $85, bringing that down to $70 including a free 25 pound turkey. So I’m really happy. SPEAKER: The coupons are easy to use. Just select them out of what they present. Once you have a loaded to your cart, anything you add to your cart to when you’re getting ready to shop, they automatically get connected. It asks if you want to use your coupon, and many of them are available for use multiple times. They also have lots of extra deals. They give you gas point see you can get discounts on gas if you happen to know someone who drives. As far as the $4.95 fee to do the shopping, I always have at least three different offers on my card where, but buying various items that I normally buy, I’m able to get that fee waived. I’m very happy with it. It works out great. People do an excellent job of picking out good produce for me. I’m able to put in comments. For example, my milk, I was asked that it be in half gallons only with a minimum expiration date of 10 days. I always get fresh milk. Everything is perfect. I was just really happy with the service and wanted to give you this feedback. I had used the Instacart delivery service for a while, but with your monthly subscription and the fact that you have to buy $35 minimum purchases to even get them to deliver it after you paid that almost $15 a month, and you have to pay $10 on top – they cost me $35 on top of what my groceries were costing me. My parents are still able to just pull up to have the groceries put into their car, and I’m able to go out and help them get groceries out of the car and into my home. BELVA SMITH: He brought up a really great point. I forgot about the click list part of it. It makes reordering or shopping so much quicker, because if there are things like milk and bread and stuff that you order weekly, it keeps track of that stuff. You just have to go and say give me that, give me that, so it does make it quicker. I am very impressed with his coupon savings. BRIAN NORTON: I know. You’re going to have to start using coupons. BRIAN NORTON: How much did he say it saved him? BELVA SMITH: He said it saved him $70. BELVA SMITH: That something to talk about. BRIAN NORTON: I think he also set a free 25 pound turkey with a. That’s insane. That’s really cool. WADE WINGLER: I think that’s going to keep growing, and we are going to see more and more stuff happening in the space. I think this is just the beginning of that. BRIAN NORTON: I was on Amazon over the weekend, and I saw this interesting — have using Amazon wardrobe? BRIAN NORTON: You can pick up to five or six different things. Will ship it to you. You get to try it on and then send back the things you don’t want. I thought that was amazing. WADE WINGLER: There are a lot of services that do that. I didn’t know Amazon was doing that. You get like a stylist, and they tell you how to dress cool. BELVA SMITH: They’ve just started doing it. I think it’s because, like you said, there are several others that are doing it. I believe not only do they send it to you to try it on, I believe you can wear it. BRIAN NORTON: You get seven days. You can wear it for seven days. You just have to ship it back within seven days. BELVA SMITH: It’s like a laundry service as well. BRIAN NORTON: It makes me wonder my new shirt that I didn’t have it done, does somebody else wear this? BRIAN NORTON: I think you’re right, Wade. I think it’s going to continue to grow. They’re looking for ways to engage people online. It reminds me of streaming movies versus what Blockbuster used to be to all of us. I think companies are going to have to get in line and get comfortable with the online medium of being able to get their services and product available to folks in that way. BELVA SMITH: I’ve heard that a lot of professionals are using those wardrobe services, because it makes traveling lighter. They get where they need to be and their clothes are delivered to them. They ship them back. WADE WINGLER: That seems a bit absurd, but I guess that makes sense. BRIAN NORTON: What if you order all the wrong things and nothing fits you? BELVA SMITH: Hopefully you’ve already used the service at least once before you do. WADE WINGLER: Or you didn’t travel naked, so you are wearing something that you could just keep on. I guess I’ve done the reverse of that before. When I used to travel a whole lot, I’ve shipped my laundry back home before. We spent a lot of time in Vegas, you and I both did it, Brian. We worked out there. There were times where I would have a whole bunch of laundry. I’m like, I don’t want to mess with my suitcase, I just put it all in a box, FedEx it back. For $10, it’s at my home and my laundry just beat me home. BELVA SMITH: I think it’s funny, because I think the services were really developed to cater to women so that we don’t open the closet and go, oh, I have nothing to wear. Because you’ve already worn everything 100 times. But I think they are finding that more men are taking advantage of it than women are, at least as many, because it is convenient. It’s just convenient. BRIAN NORTON: I think a lot of people – they do that for furniture, right? A lot of folks rent their furniture for the party you have, and then it gets picked up and taken back away. WADE WINGLER: Those are clearly cool things to do because I don’t do any of them. BRIAN NORTON: Can’t afford any of them. Too much management, too much to manage in that situation. WADE WINGLER: It’s all about convenience. I get it. BRIAN NORTON: So our first question is, I keep getting unwanted phone calls on my phone. Is there a way to block certain callers? WADE WINGLER: Most of my phone calls are unwanted phone calls. I don’t just mean I’m a curmudgeon and people are bugging me. My phone, one of the rings, I hardly answer anything unless it’s coming up on my caller ID. It’s just and 15 spam calls a day. BELVA SMITH: Yes. That’s exactly where I am. It all started happening to me within the last five months. It’s gone to where I just want to answer my phone. Every now and again, I forget and do answer it. It never fails. I shouldn’t have answered it. Recently I was getting the call that was telling me that if I didn’t return the call, I was going to go to jail for the IRS or something. BRIAN NORTON: You’re still here? BELVA SMITH: Yeah. So I decided, okay, the second time I got it, I’m going to block that call. I block the call, and the very next day, from a different state, a different number I got that same phone call. I block that call. I did that to five different numbers for that same call. I haven’t gotten that call for a while, but it did take blocking five numbers. It’s pretty easy on the iPhone to block a call, even if you’re using voiceover. All you have to do is go to your recent call list and swipe down until — you will want to do it as soon as possible because it is going to be less swiping. Just listen for the number that the call came from and double tap to open it. On the right side of the screen, there is a symbol. I think voiceover says something like additional information or description – it’s two swipes to the right, I believe. If you double tap and scroll down to the bottom, you’ll find a block caller. So whatever the caller was will then be blocked. However, it’s also going to block their text and face times. Just know that it doesn’t mean they are not going to call again because they are just going to change the number and try again. I understand it’s just as easy to do on the Android phones. Of course, I’ve never done it on Android phones. You are going to go to your call log. You are looking for disabled incoming calls from that specific number. Instead of finding — sorry, not instead of. Basically the same thing. You are going to find the number that the call came from and choose to disabled incoming calls. Then, if all else fails, you can get on the registered do not call list. I don’t know if that’s beneficial. I know we did it with our landline. I didn’t realize you could do it with a cell phone as well. BRIAN NORTON: I think that’s been added. BELVA SMITH: We did it with our landline, and it did make a big difference. From time to time, we will still get one or two, but it’s not out of control. You can register in two ways to get on the do not call. You can call them, or you can go to their website. BELVA SMITH: Okay. I was going to say, I don’t know that. But I do have the number, which is 1-888-382-1222. BRIAN NORTON: I think you can register up to three different numbers, so for each call, you can register three different numbers that would get added to the do not call list. BELVA SMITH: Maybe. I’m not going to say that you can’t, but I think you have to be calling from the number that you want to have added. BELVA SMITH: I’m pretty sure that when your call comes in, they track that number. BRIAN NORTON: That may be only through their website. I think you go to the website, you can add a number, three separate numbers that once. I think it’s also important to say once you’ve been registered and keep getting these spam type of calls, you can call them and list a complaint with them as well. Even though you are added to the do not call list, you may still get certain calls that leaked through. If you do, you can call them and file a complaint. At least registered with them to know that there is something getting through, maybe they need to look at something like that. BELVA SMITH: I think if I’m not mistaken, the do not call list is going to block the telemarketers, which is a different group of calls than the guy who is calling me to tell me the I’m going to go to jail if I don’t return the call. Those aren’t telemarketers. WADE WINGLER: These are spam calls and phishing calls. They don’t come from the US most of the time anyway. They are speaking US phone numbers, but they are not subject to the do not call laws because they are not a US company. I’ve become so frustrated with this. Recently I got really frustrated because I was waiting on a call from my doctors office, and I didn’t have the doctors office in my phone book. These phone numbers often look like numbers for places that I know. It says this is coming from the town to towns over. That must be the doctor, but it’s not. There are a bunch of apps that can help with this as well. I recently played around with one called – I don’t like the name – Robo killer. BELVA SMITH: I’ve heard of that one. WADE WINGLER: The thing I like about it is they have an ongoing list of over 1 million spam numbers that they know are coming from places like that. It allows you to add numbers to it. It’s like a crowd sourced thing. They claim they can do a 90 percent reduction of spam calls within a month of using it. You can sign up for a seven-day trial — and I did this. It’s an app that I put on my phone. You have to do some funky stuff. He had to issue some codes to your carrier so that they actually get all of your calls, and then they pass them immediately through. But they are screening out these known spam callers. The other thing they do is if it is one of those spam numbers, they’ll actually answer it. They play a recording and pretend – they sort of mess with the spam caller. If you’re calling to tell me that I’ve been summoned by the IRS, maybe they have a recording that says you’ve won a new car. They jerk around the spam callers and sort of try to beat them at their own game by keeping them on the phone. Or they’ll answer the phone and pretend you are inebriated or something. Or it will say, hold on, he’s here. For a minute. Let me get them for you. And then wait. Wait, wait, I’m going to transfer. And they mess with them. The thing I liked about Robo killer is they record those so you can listen to them, so you can listen to them mess with the spam callers. It’s quite entertaining. They have some on the website where it is really funny stuff where the spammer is being totally jerked around and messed with by these recordings that are cleverly recorded. The truth of the matter is, when I installed it, it didn’t do a great job of blocking them. It still let a lot of them through. And then when I went to go listen to the funny calls or the things I thought would be funny calls, I couldn’t get them. They didn’t work. So I did the seven day free trial, and then they wanted something like $4 to $5 a month after that to maintain the service. I didn’t. I just a disconnected it and got it turned off. But I like the idea, I like the concept, and I think there are a number of apps. That’s done when I tried. We’ve got to fix this. BRIAN NORTON: I’m wondering if the call that got through weren’t a part of their list. WADE WINGLER: Maybe not. I did click in the app that this was a spam caller and hopefully added it to the list. Maybe I helped the next person. BELVA SMITH: Maybe you helped the next guy. BRIAN NORTON: I don’t know. That’s interesting. So if you guys have had experience with this and have a different way to be able to block – maybe it’s an app like Wade mentioned. We would love to hear about it. Our phone number to give us a call is 317-721-7124. Or you can send us an email at tech@EasterSealsCrossroads.org. We would love to be able to hear from you and be able to provide that to our listeners. BELVA SMITH: You’re going to get all kinds of Robo calls. BRIAN NORTON: That’s all we get on our Google voice now. WADE WINGLER: The IRS is out to get you Brian. BELVA SMITH: I have also heard that getting a Google voice number is a good way to eliminate that. BRIAN NORTON: Really? That’s interesting. BRIAN NORTON: Our next question is, I am hard of hearing and would like to have my voicemails transcribed. I know the service is available on the iPhone, but I can’t seem to do it on my Android device. Any ideas about how to get this on my Android, or if there are apps I can download? Just put it in context a little bit, this is often called visual voicemail, where when you get a voicemail, most major carriers provide the option of being able to get it transcribed for you. To get a little printout of their best a voice recognition job of understanding and telling you what that voicemail is so you can preview it before you listen to it. I know places like Verizon, AT&T, Sprint, T-Mobile, a lot of the major carriers offer this service. Some may or may not require an additional fee for it, but you can certainly get it added or activated on your phone before installing it. There are apps as well. There are a few apps out there out for you. There something called YouMail. It’s about five dollars per month. There is another one called HulloMail, which is H-U-L-L-O mail. What I like about this one is there is a light version. So depending on how many voicemails you end up getting, you can pay – I think it’s $.99 per month if you get a certain number. I don’t know exactly what the number is. Or there is a prohibition which is available for $4.49 if you get a large volume of voicemails. That’s a subscription-based service where you. There’s also InstaVoice, can also do some of these things where you — what I like about InstaVoice is you can handle multiple numbers. But what I’ve heard about it is it’s not very full-featured when it comes to providing the service for you. As always, Google Voice does it for you. That’s what we use here for our shows. WADE WINGLER: Our listener line is actually a Google voice box. That’s one of the things we like about it, because when we get calls for our various shows, it does transcribe them. We will email those around to see where they are going to go or if we can help the callers. It’s super handy to have those already transcribed so that you can see is it a spammer, because sometimes they are – not very often, but then you can do that. I’ve been relying on the for a long time. The problem is a means change your number that you give out to people. You would have to set up a Google voice box and pointed to your cell phone and give out the new Google voice number to people. There are sort of some gyrations and changes you would have to go through. BELVA SMITH: Once you’ve done that, once you’ve got the Google voice number got your never going to have to change your number again. WADE WINGLER: On the screen will stop doing it or start charging. I’ve always wondered. Because it’s free. It’s great. But are they going to keep doing that? I don’t know. BRIAN NORTON: I do love the option to quickly look at something, do I need to jump on that? If it’s really important. It does a very good job of transcribing what was being said. BRIAN NORTON: It can depend. BELVA SMITH: It says, transcribing could not happen, or transcribes it and it is so horrible that I need to actually listen to it to find out what – first of all, what is their name, and then what are they trying to say to me. I’m not that impressed with it. But again, I’m not paying for it. That’s just what I’m getting for free through AT&T and the iPhone. WADE WINGLER: Get a just for it anyway. BRIAN NORTON: Exactly. If you really do want to listen to it, you can go to a quiet room, a place you can hear better to be able to listen to the voicemail. It’s a pretty good service. There are apps, there are services that will provide that for you. Most of them are going to cost you money. It’s going to be about five dollars per month for some different services. WADE WINGLER: You mentioned going to one of the room where you can hear it better or where you have more time or less background noise. I love the fact that you can forward your voicemails. It’s not ideal and not the maximum independence, but you can for that was to somebody you know and trust and say, what did he say? If there was a particular part of it that you got stuck on, it’s nice to be able to afford those and that somebody listen to them for you. A lot more options these days. BRIAN NORTON: I love to forward them to my email. WADE WINGLER: I love to forward mine to you. BRIAN NORTON: I’ve been noticing that recently. BELVA SMITH: I do like getting my voicemail in my email. I don’t know why. Why does it make a difference that it’s coming to my email versus coming to the app? BRIAN NORTON: Hacks. Having it in my email just lets me know I need to address it later on. BELVA SMITH: You know, Brian? WADE WINGLER: Just put a post it note on it for the ones you want to keep. BELVA SMITH: That brings up a very good point for all those Apple developers. You should be able to mark a voicemail as unread or read. And you don’t have the option. WADE WINGLER: It’s because it’s a lie. You’ve listened to it but you want to say you haven’t listened to it. BRIAN NORTON: Have I listened or un-listened to it? I wish I could do that. I have lost many things that get buried in my voicemail box. WADE WINGLER: So you say. BELVA SMITH: What I should say since I complained about how bad I feel like it is on my phone, it’s also still in beta. WADE WINGLER: That’s code for it doesn’t work very well yet. BELVA SMITH: Exactly. Whenever you see the word beta, that’s what you know. BRIAN NORTON: All right, the next question came through an email. I work for a non-for profit in the social services arena, and I am looking for a HIPAA compliant text messaging option. My understanding is that texting isn’t secure, but many of my younger clients prefer to community it through texting. Thoughts? WADE WINGLER: Don’t look at me. BRIAN NORTON: I looked immediately at Wade because he is our security officer here at Easter Seals Crossroads. Really, I think it’s important to note texting is an issue, because it’s usually not a secure service. So if you are texting private health information in any manner, that can be an issue with regard to the above. You don’t want to get in trouble by the HEPA police out there, so you have to be very careful. BRIAN NORTON: That’s about all I have on it. BELVA SMITH: I’m just going to say, for some of my consumers, texting is our only method for communication. BRIAN NORTON: It’s becoming more and more, the younger the folks are. My daughters don’t answer my phone calls. They want me to text them. But I have clients who can’t answer a phone call or can’t make a phone call. WADE WINGLER: I’m not a lawyer. I have to say this like five times. I’m not an attorney, this is not legal advice. Because these are legal types of questions. There is a lot going on. HIPAA was passed a long time ago when things like the prevalence of texting wasn’t as high and things like faxing and the US mail were the most commonly used way to transmit information. Ironically, sending a fax is HIPAA secure, even though you really don’t have an idea who is going to receive the fax on the other end. Sending it through the US mail is also considered legitimate because there are mail fraud laws out there, and the government when they passed of this, consider that enough of an assurance that the information wouldn’t be stolen or intercepted, that that’s okay. I have some personal feelings that I don’t feel regular mail and a fax is nearly as secure as some of these other messages or ways to send messages. Texting is and isn’t, technically, an issue. You can’t send protected health information, which is really and information about somebody you serve in a healthcare setting, in an secure way. HIPAA doesn’t amend the encryption, although it provides safeguards so that if you are sending information in an encrypted way, and it stolen or intercepted, the high-tech rule, which was part of the American recovery act, said that encryption provides a safe harbor, so that if somebody does still your encrypted information, you are basically off the hook. This is where it gets sort of tricky because you can send an encrypted email. You can send encrypted information through a web portal or those kinds of things. A text message is inherently not encrypt-able. It’s just text sent through SMS protocols. It hits different telephone carriers from point A to point B. See you can do a couple of things. You can text and not include protected health information, then it’s fine. But almost anything you would want to text is likely going to contain protected health information. You can also send a secure text, but there is not a standard for secure text messaging platforms, which means that you on the receiving end and be on the sending and would both have to have an agreed-upon HIPAA compliant – or at least encrypted — texting program. And there are some out there like ZoomText and Tiger text and those kinds of things, our options out there. But then you have to tell your client or patient or the person you’re trying to send information to from your healthcare facility, hey, we use this platform and this is what a cost to get text messages. If you are like me, you pay attention to real text messages All the other communication platforms you don’t pay as much attention to as you do a text message. Some people aren’t going to be able to install it. They won’t want to pay the have to. It almost becomes impossible to get a secure text system up and going. So it’s a little bit of a sticky wicket when you have generational issues and people who prefer texting as their primary way to interact, or people who are deaf or deaf and blind and have different disabilities, which means texting is a more appropriate or more readily available thing. Our position here at Easter Seals Crossroads thus far has been thou shalt not text. Guess it’s not secure, and opens up a lot of risk for us. However, there has been some new information about this. Richard Severino, who is the director of Health and Human Services Office for Civil Rights – and they are the guys who enforce HIPAA – they have recently issued some new guidance that says you can send standard text messages if you do it in a certain way. Now for anyone who works here, we are not doing it yet. We are having meetings these days about how we might rule this out. But he says you can text and still be HIPAA compliant if the healthcare organization informs the patients that the text messages are not secure, it gets their permission, documents their consent. So if you have a client or consumer or patient that says “Hey, I really preferred and only want to hear from you via text message,” and you say something like, “Yeah, but you know that’s not secure. A hacker could get it.” And they are “Like, yeah, I don’t care. I will sign my name saying that I don’t care. I want to interact with you via text message.” Then you can do it, according to this recent information from the director of office of civil rights. I don’t know if there is case law that bears this out, and I haven’t seen any additional guidance. Here’s the challenge for me. Here at this organization, we serve 7000 plus people a year. Some are going to say, I only want to interact via text message and sign it. Of us aren’t. I don’t know how to keep track of — Bob was a text message. Sue does not want the text message. Randy says never ever text message me. It’s really difficult to keep track of who wants that and who doesn’t and make sure that, as individuals who are texting from our healthcare facility, that they are remembering which one once it’s, which one doesn’t. A gets really complicated. Not to mention the past that most people here don’t have company issued cell phones, which means they are texting from their personal phone, which isn’t secure, isn’t encrypted, and I have zero control over it. The technical advice from office of civil rights — and if you just Google text HIPAA and new guidance, you’ll find several article talking about was Severino said. That the single thing is you can do it if you have their consent and you document it and they request it. The practicality of rolling it out, from my perspective as someone responsible for it, is really tricky because it is super easy to mess that up. You only have to mess it up once and you are in hot water. BELVA SMITH: Right, and the minute that you start trying to track that, you’re going to give access to that information to everyone. Because I have to be able to look and see that John the only wants a text or has accepted a text, and Brian has to be able to see the text as well to know that it’s okay to text with them. WADE WINGLER: And you can’t say, well, when we admit everybody into our system, we’re just going to make that an option. We could, but how do you keep track of that? It’s complicated to keep track of that from an organizational standpoint. We are moving in that direction as a society, and as a HIPAA compliant people, our organization, we are trying to figure out how to make that fly. BRIAN NORTON: I look at the way I communicate with my doctor. I use an app called My Chart. But it’s email. It’s a secure email system with a bunch of bells and whistles built into it. It’s not text messaging. Was nice is I still get the red number one saying there is a message for you, better go look at it. WADE WINGLER: That’s a decent intermediary system. That’s tied into their medical record systems. So the doctor is not texting you, the doctor is sending something through the email system and you chose to get a text alert. It’s still not text messaging. It’s just a text notification that you have a secure email. It’s closer. We are getting there. WADE WINGLER: You just have to keep track of it. My direction for people who work here, thou shalt not do it until we get this figured out. It’s against our policies and procedures. But we are making progress in that direction. Severino, when he gave this talk where he said the stuff, he said this is how people are communicating, and we have to figure out how to get there in a way that bounces security with convenience. That’s always what IT security is all about, bouncing security and convenience. You want to make it inconvenient enough that the bad guys can’t get the information but convenient enough that the good guys or your customers can. BELVA SMITH: That’s very well said. BRIAN NORTON: I think it’s one of those things that will take time to figure out in time to implement. Maybe if you guys – if other folks are living in this HIPAA environment like we do and have had experience with the text messaging and trying to communicate with some of your clientele, we would love to hear from you, what your stories are, and maybe solutions you’ve implemented to help with that. That would be interesting for us to know. You can let us know or our listener line that is 317-721-7124, or through our email which is tech@EasterSealsCrossroads.org. BRIAN NORTON: So our next question is, does anyone know of a wireless button that can activate an Amazon Echo. I’m finding for many of my clients that the device can recognize poor speech was the device is activated, but struggle to recognize the trigger word, which could be Alexa, echo, computer. There are a few you can choose from. The device has a button on the top of the user can press, instead of saying Alexa, which works really well – but I’m looking for a wireless solution. And the suggestions would be helpful. BELVA SMITH: You just woke everybody’s personal assistants. BELVA SMITH: In researching this, they’ve recently added Amazon. Now there are four. WADE WINGLER: Another trigger word. WADE WINGLER: it is a good point that changing the trigger word to those different options may work with a particular individual and their speech. BELVA SMITH: I’m not really sure why they are keeping such a tech cap on that. Why can’t we name it what we want to name it? There’s got to be a reason. BRIAN NORTON: I don’t know. That’s a really good question. WADE WINGLER: It’s constantly listening for the trigger word, so you would have to program what that word is with all the different ways that people pronounce it. Otherwise you would have to train it. You would have to sit here, like with Dragon, and repeat the word over and over again to get all the different ways that you say it. My guess is they are locking it down to just a few ones, and they can algorithms on it so that it does a better job. I think it works better. BELVA SMITH: She does have more trigger words than the Google home has. WADE WINGLER: Do the Echo buttons do this? Is this what they are designed to do? WADE WINGLER: I haven’t messed with them. BRIAN NORTON: I’m pretty sure. BELVA SMITH: Yes, a sequence of events or make something happen. But I don’t think that they wake the device up. BELVA SMITH: But that’s not the trigger word. WADE WINGLER: Just turn it on and wait for your next command. BRIAN NORTON: Big Mac communicator. It’s just a big button, made for communicating for individuals who have a difficult time speaking. You can record messages on it. It has a built-in recorder, and when you press that button, it’ll say word for you. It is a sentence or phrase or whatever you need it to say. I’ve seen it trigger the Alexa or Amazon Echo, as far as that is concerned. BRIAN NORTON: I don’t know exactly how expensive they are. BRIAN NORTON: Big Mac communicators. I think they are about $99, which is a little expensive. But you can also do it with other things. Any smaller recording device that has a button where you can press the button to do that. BELVA SMITH: I thought about that as well. BRIAN NORTON: I had individual who had a computer, used a text-to-speech option on his computer to just read the word and also have the commands written, Alexa, and it would pause a couple seconds. It would say, what does the drive to work look like. The computer would just read it. It did a fairly good job of recognizing that as well. I think there are a lot of wireless options there. I don’t know if folks have heard of the Tecla app. It’s kind of a switch control device for using your iOS devices. But you can create a button that can basically allow you to talk to Alexa. They talk about that, and you can find it on the iTunes Store. You can look that up and they give you some examples of how that might work. The cup the app. I’ve also done things with the Flick button. Again, I don’t know if the Flick button would be applicable because it uses Bluetooth. Does the Amazon echo have Bluetooth built in? I don’t think so. WADE WINGLER: They do. That’s how you can connect to them as a speaker. BRIAN NORTON: So the Flick buttons are these wireless funds that are primarily used to connect to your phone. I guess you could connect it to the Alexa app through your phone. I haven’t played with this or done much with it. They are tiny buttons that you can place all of the place. They will fire off a command or do something, active an app or do something like that on your smart phone or smart device. BELVA SMITH: I will say they are Bluetooth, because that’s also how you connect your thermostat and stuff to it. But I think – I would check to make sure that it’s going to be compatible. You can also trigger it from your iDevice, your iPhone, iPad. BRIAN NORTON: You can Bluetooth switch or even a direct connect switch. There are a couple of options to use switch access on your iPhone to maybe control the whole Alexa app if you want. BELVA SMITH: I just pulled up my Alexa app and my phone is saying search right now, so it means my phone doesn’t have a signal, which I don’t know why. If things I’m in Millersville, wherever that is. BRIAN NORTON: That’s a problem. It does sound like there are options as far as wireless buttons are concerned. I think your simplest and least expensive one would be to do something like the big Mac communicator or a similar device that allows you to record a message and you can just press a button to play a message. The challenge then becomes — in this particular situation, it talks about how once he got past the trigger word, it work pretty well for him. But if you are struggling with some of the other phrases you need, you might have to work on the big Mac or a step communicator. There are step communicators where you get to record three different messages and you can do Alexa for your first message, press the button again, say what’s the weather like today, press it again, what’s my drive to work look like. You have a step communicator to get to some of those other commands. Just some different thoughts. BRIAN NORTON: A folks who are listening have suggestions or solutions for this particular individual, we would love to hear from you. You can give us a call on our listener line at 317-721-7124. Or send us anymore at tech@EasterSealsCrossroads.org. BRIAN NORTON: Our next question isn’t really a question, but it’s definitely a showdown. This is our app showdown question of the day. We are going to be talking about Dragon versus Windows speech recognition. This is where we take a look at two similar products and bring it down for folks, talk about what some of the differences might be. We will look at these two apps today. I’ll start us out today just looking at this. This is that I’ve dealt with over the years with Dragon versus Windows speech recognition. As I work with individuals and do assessments, I’m looking at which would be the most applicable thing for them based on what they are doing. I’ll be the first to admit, Dragon and Windows speech recognition — first off, for those who aren’t familiar with it, those are speech to text programs where you are talking to the computer and it’s putting text on the computer. Or, depending on your need, if you have a mobility need, it actually will allow you to fully control the computer. They do that in a variety of different ways, but different voice commands, you can open and close programs, navigate with a mouse, click on buttons, open menus can’t really get full access to the computer without ever touching the keyboard or mouse. In my opinion, it’s not necessarily something that, if you do have keyboards or mouse access, it certainly something you want to use because you can use it simultaneously with speech recognition. Sometimes things are just more efficient when you use a keyboard or mouse. Keep that in mind. You don’t have to use one or the other. You can do things simultaneously, if you can. The biggest difference would be cost. You are thinking Windows speech recognition is built in to the computer, so it’s absolutely free. It’s been there forever, so I believe Windows 97 was the first time that it showed up in the Windows computers. It’s been there forever. BELVA SMITH: It was always awful until Windows 10. BRIAN NORTON: It’s got a whole lot better. BELVA SMITH: Windows 10 is a big change. BRIAN NORTON: Dragon has been around for ages. I’ve been here for 22 years at Easter Seals Crossroads, and it was around when I got here. It’s changed a lot over the years. BELVA SMITH: It was version 3 when I first started using it. BRIAN NORTON: I think I was just at the beginning of version 2. Wade, I’m sure when you started it was version 1. WADE WINGLER: It was version point two, or something like that. It was so long ago. It was introduced in Windows XP, so it didn’t come around quite that early. It got pretty good. Actually that was one of the things that Windows Vista had, was pretty decent speech recognition, and then it jumped and Windows 10. BRIAN NORTON: Which is going to cost you less than that. BRIAN NORTON: Okay. It depends on the bells and whistles you need with that. Often times, it really depends on what you’re doing with it. If you are in a business situation where you need to access things that aren’t traditionally that speech recognition user-friendly, if you will, getting the professional version will do you a lot better with Dragon versus maybe the Windows speech recognition. It’s just similarly more intuitive, Dragon is, when you use it. BELVA SMITH: You can do that speech recognition, if you do it in Word and you create an auto correct option. BRIAN NORTON: But only in Word. Or where AutoCorrect is available. BRIAN NORTON: I think the difference between even a solution, Belva, is that like it will actually format the text. I think with the AutoCorrect, you get one single line with all the information printed out. With Dragon, you can say Brian Norton, new line, 4740 Kingsway Drive, new line, and really get it formatted the way you want it in particular programs. The other thing that’s available is not just text macros, but we also have computer macros. You can say, open Facebook. And from your desktop, it’ll open up your start menu, find Facebook, type F-A-C into the search box, it’ll bring up Facebook and get you multiple steps. It will open up Internet Explorer, send you the address bar, type in Facebook.com, hit the enter key. You can do it to do multiple steps with just a simple command. We’ve used that a lot with folks who have a job and need to get access to the programs and a lot of the controls and other types of things aren’t accessible. Maybe they are through the mouse movement, but it’s not very efficient for them. So we use these macros to speak them up and get them places they wouldn’t be able to go with voice, a lot faster. Those will be the two really stand out features that would be different. I think as far as environmental consideration and microphones and other things, I think it’s pretty similar between the two. They are both speech recordation programs, so you have to be careful with where you play with them and where you use them. Sometimes overhead noise can play an issue, if you don’t have the right the microphone, so microphones become a real stickler to get the right type of microphone for you. With all of this, as far as comparison, I think sitting down with someone who is knowledgeable and what those programs can do, who can look at what you’re trying to do with them and help that some of those things with you, would be helpful. Belva, thoughts on that? BRIAN NORTON: What is J Say for folks that don’t know? BELVA SMITH: I’m getting there. So if you are a person who is blind or low vision, and you rely on a screen reader to give you the information that’s being displayed on your computer screen, but you also have a physical inability to type, so you need to control the computer with the voice recognition, you can to just install Dragon NaturallySpeaking and a screen reader on the same computer and have them work together appropriately without having a third-party program, which is the J Say. It kind of marries the two programs together and that allows them to work beautifully. The speech recognition knows when to listen for your command or your dictation, and not listen to the screen reader giving you the information that’s being displayed. It’s a very complicated situation, but when it’s set up and working well, it’s a bit of a thing. But with that being said, I think that something that I don’t think can be done with speech recognition. BRIAN NORTON: I thought there was a new option. BRIAN NORTON: But I haven’t heard a lot about it. BELVA SMITH: I haven’t experienced with it either. I think one of the folks on staff here have used a little bit. BRIAN NORTON: I think Josh may have played with it. BELVA SMITH: Jim. It’s a bridge that allows – I think it’s Google voice or something. I don’t know. The other big difference is speech recognition works great as long as you are within the Windows environment. But if you want to go into a third-party app or program, I think is not going to be as responsive as what Dragon would be. So if you are in a work environment and perhaps there is a specific database you go into, but it may not be a Microsoft database, your speech recognition isn’t going to work. In most cases, especially in a work environment, for speed and accuracy and reliance, Dragon will be the best solution. But if you’re just want to sit down – for example, I have a consumer who is writing a book. Typing speed isn’t the greatest, accuracy isn’t the greatest. But he can sit and talk for hours to the computer and let it pick it up. He uses the Windows speech recognition to do that, and it works well for him. I think it really depends – first of all, how much money do you want to spend? How much you need it? Are you just going to use it from time to time and just to do some dictation? Which I will say Windows speech recognition – and I just did a presentation on this – it’s really become great. BRIAN NORTON: It’s much better than it’s ever been. BELVA SMITH: Not just the dictation piece, you can control the computer with speech recognition. BRIAN NORTON: I’ve had clients who prefer it over Dragon. BELVA SMITH: Yeah, because it seems more intuitive. Dragon has to be so specific. I also find that it seems to be more user-friendly with the onboard microphones. To me, Dragon requires a better microphone. You can get it to work with an onboard microphone, but not as quickly and easily. It takes two minutes, if that, to set the speech recognition with the onboard microphone. BRIAN NORTON: I did look up the other version of J Say. The free version is called dictation bridge. BELVA SMITH: That’s for NVDA. BRIAN NORTON: That’s to be able to bridge NVDA with the Windows speech recognition. Like you mentioned, it’s kind of new and in development and continues to be in development. It’s not necessarily as refined as what J Say has been. But it’s a free version. BELVA SMITH: It’s a free version, yeah. I think they are both great programs and, just like anything else, it comes down to how much money you want to spend and what you’re going to do with it and how badly you need it. I just want to close with saying what you said to start with, Brian. If you can type, type. Because using your voice to control the computer, even on its best day, can be frustrating. BRIAN NORTON: A lot of people we work with use dictation for some activities on the computer, but they use their mouse and keyboard if they can for navigation and getting the cursor where it needs to go. It’s just faster and more efficient for a lot of folks. BRIAN NORTON: And it works simultaneously. 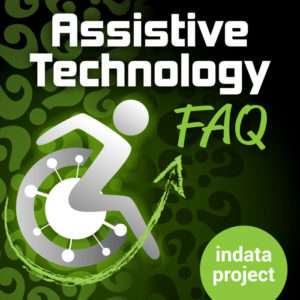 I will say if you are interested in learning more about these and doing a comparison between the two, a lot of the assistive technology acts have a loan library where you can borrow the future with the software on it, try it for a little while, 30 days, see if it works for you. They can tell you were to purchase it if it needs to be purchased. If you are interested in your local Assistive Technology Act, as least for the folks that are in the United States or US territories, you can go to EasterSealsTech.com/states and look up your local AT act. I know there are lots of people who use speech recognition before. If you have any feedback, maybe your personal experience between Dragon or Windows speech recognition, we would love to hear from you. You can give us a call on our listener line at 317-721-7124, or send us an email at tech@EasterSealsCrossroads.org. We would love to hear from you about that. I’ll even throw this out. If you guys have an app showdown you want us to talk about, how some apps compare to one another, let us have your suggestion with regard to that. BELVA SMITH: Let me throw one more thing in there. I talked about how well speech recognition has improved with Windows 10. I have to say, currently, I’m working with a consumer who is using — what’s the current version? Dragon 13? BELVA SMITH: Well, I’m behind. I think we are using 13 or 14. Anyway, it’s on Windows 10. I’m impressed on how far it’s come. If you haven’t taken a look at the Windows speech recognition or Dragon NaturallySpeaking in a while, it’s really impressive how far they’ve come. If they continue to improve, it’s going to be amazing where they are at in 2 to 3 years from now. BRIAN NORTON: I would agree with you. Not to keep adding on to this question, but Dragon, and any kind of voice input system, is something that, as new releases come out, they are the kind of program that I would always recommend people upgrade with the upgrades. When something comes out with voice recognition, your improved accuracy and other kinds of things with voice input systems, traditionally those upgrades come with some things. There is really a noticeable difference with what happens and your ability to get better recognition from it. I would always recommend people keep up with the upgrades when it comes to speech recognition software. BELVA SMITH: They’ve just improved the commands. Surfing the web used to be so challenging to use Dragon – I never really tried it with Windows speech recognition. But surfing the web now seems like a piece of cake. BRIAN NORTON: It gets a lot easier. WADE WINGLER: At least moments. BRIAN NORTON: It’s a question we haven’t had any time to prepare for. What have you got for us today? WADE WINGLER: Belva, how long have you been doing this? 10? 12? BELVA SMITH: Yeah, ten plus. I’m too young to have been doing it for that long. WADE WINGLER: You started when you were in junior high. The thing is, over the years, we have moved from system to system to system for information like wordprocessing documents, IMO systems, all these things. I’m a very paperless kind of guy, so I like to scan stuff and. I like to keep stuff archived. My problem is sometimes I lose stuff. I’m expressing this data via petition were some of the information I need is an email, some is on the network drive in an apartment folder, some things that aren’t hypocrite compliant are in Evernote, some things in dropbox. One time I tried Google drive and didn’t end up using that much. There are times when I know I have a document with some information in it, but I can’t remember which platform I saved it on. We are moving to office 365 here soon, so I’m hoping to get everything crammed into one system and get it all married up again. Do you guys have a situation where you know you have documents, but you can’t remember which system you put them in? How do you deal with that? BRIAN NORTON: Yes. All the time. Mostly I split my time between Evernote, dropbox, and my computer. I have a local folder set up called SSD that I’ve made secure. I’ve used FileVault on the Mac to be able to get that fixed up for me. I go between those three folders. Sometimes I still can’t find them because I have hundreds of folders under each of those areas. What I’m using a lot, my dropbox syncs with my Mac, and I just use Spotlight to look for things. A lot of times, I’m able to find it. If I can’t, then I had for it forever. I’m frustrated by that. BELVA SMITH: I think that’s one of the areas where our personal assistants are letting us down. I think we need to be up to have a storage vault on our personal assistant, maybe not for our work stuff, but for our personal documents. We all have our medical and house and car — I have a filing cabinet at home, but things don’t tend to make it into the right filing drawer. As a lot of people know, my boyfriend is visually impaired, so having a pretty document is in that helpful for him. I used to use Dropbox, but I got a notification a wild back that it was going to be closed if I didn’t login. I didn’t login. BRIAN NORTON: You don’t have anything on dropbox? BRIAN NORTON: To use any other ones? Box.net, Google Drive? BELVA SMITH: I use these things called thumb drives. BRIAN NORTON: What are those? Good golly. WADE WINGLER: One of the things we struggle with here is some of our stuff contains protected health information, calling back to our earlier conversation. You can’t put that on a thumb drive unless it’s encrypted or some of these other systems. I have different kinds of information in different places. I can’t find stuff. On Mac, I have found a tool called Timbo, which cost a few dollars. It’s a better searching tool. But it’s not going to search – I don’t think it searches my email, and it certainly not going to search my Evernote while it is there. My stuff is all over and I don’t know how to find is sometimes. BRIAN NORTON: I do use an email program called airmail. It gives me some shortcut to send it directly onto Evernote or two other areas. My to do list, if I did you do something. I don’t know if there is a good solution to that. WADE WINGLER: Maybe we throw it out to the audience for their advice. BRIAN NORTON: I will say, Wade, you capture everything. WADE WINGLER: I capture it all. And then I can’t find it. BELVA SMITH: But it’s captured. BRIAN NORTON: Maybe it’s being more judicious about what you capture. WADE WINGLER: There is probably some truth to that as well. You never know – I’m starting a new project, and that project fizzles and then I don’t clean that up. I just leave that stuff. BELVA SMITH: You never know when you might need in the future. It’s like your favorite pair of shoes. They are not worn out, but you throw them away because they’re old. Then you find yourself a year or two later going, hey, I’ve got that one really cool — oh, no I don’t. BRIAN NORTON: Absolutely. Thoughts our show for today. I would love for you guys to send us your questions by calling our listener line at 317-721-7124. Or sending us a tweet with hashtag ATFAQ. Or emailing us at tech@EasterSealsCrossroads.org. Without your questions, we really don’t have a show.